Should children be exposed to secular media? | Audio and video stories from Southwest Washington. For most children it’s an everyday occurrence to spend time in front of a television or game screen. What happens when their parents’ values and belief systems clash with those offered up by the entertainment industry? Parents who struggle with this clash of cultures can turn to family life counselor Diane Moore for help. 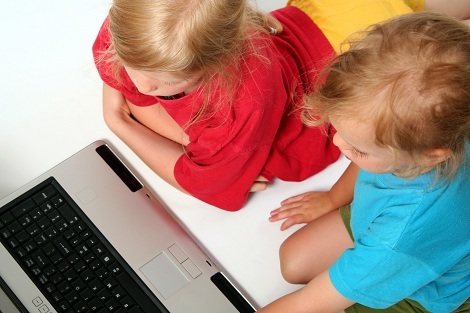 Children spend time in front of a variety of screens. Photo: used with permission from Dreamstime. In this audio coaching call, Diane Moore says parents have choices: They can either shelter their kids, or figure out how to “do” the cultural thing. She explains that children age 12 and under need to be protected from unwholesome, gratuitous influences. On the other hand, if the child is 12 or older, the parents’ job is to prepare the child to think. Moore counsels families to ask three questions: Is the entertainment done well, what is the message, and is the message true? According to Moore, higher quality media productions go straight to the brain without any alerts. Therefore, even programs that are well done need to be examined for the underlying message. If you make it a game children can tap into their puzzle solving skills. Each person will come up with a different interpretation, so don’t try to find the right or wrong in the answer, says Moore. The final consideration Moore suggests is to examine if it’s true and is it true to life. For example, in the movie Pirates of the Caribbean, pirates sail away with their bounty escaping the law. Well, modern day “pirates” or thieves get jail time. TV, reality TV, and video games are all about “high brain reward.” These kinds of things make actual reality seem boring to kids. As a result, they become less motivated. To overcome this problem, parents need to get their kids excited about the real world of science, art, literature, outdoors, etc. For older teens, parents could draw a line in the sand and say “no” to questionable material, but at this stage, the time for driving home a lesson is over. This is the time when the teen’s thinking process needs to be tested. If the relationship is good, the three-question game can work. If the teen isn’t interested, parents should offer their input and gently challenge teens to reevaluate their choices, and then let the teen wrestle with their decision. What resonated with you from Diane Moore’s advice? ENTER TO WIN a FREE book written by Diane Moore. Leave your thoughts in the comments section on this post, or our previous one, Three simple steps to obedient children. Parent Talk is going live soon. If you would like to be one of the first to know when, email us at ParentTalk@couv.com. We’ll send you Parent Talk Live updates.